This program focuses on the experiences and skills of early Ohio settlers and pioneer life in the Maumee Valley in the 1800s. Content and sessions vary depending on age of students and length of program. Teachers can chose from the following list of options. The program sessions will be tailored to meet the length of the program visit. 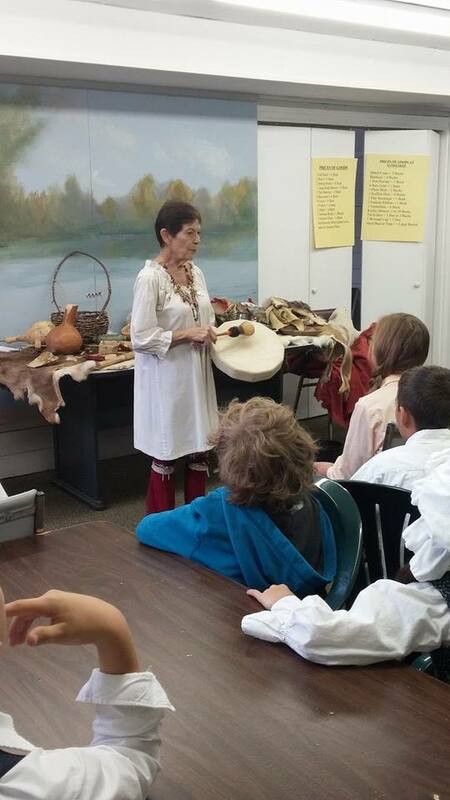 Native Americans: Learn about the Native American tribes who lived in the Northwest Territory including their dress, houses, utensils and trade goods. Students will have the opportunity to handle real artifacts. Pioneer Daily Life: Set in an actual log home from 1840, students learn what life was like for the early pioneer families. Historic Trades: Students will learn about a variety of historic trades found in early communities and create a shop sign for their own business. Photography: Students will learn about early photography and have a chance to hand color postcards to take home. Candle Dipping and Butter Making: Students get up and moving as they not only learn how to make butter and candles but get to try their hands at both. Students will each make a small candle to take home. Travel and Transportation: Held in our 1858 train depot, students learn how changes in technology impacted immigration into this region. Students will also have a chance to explore our 1915 Locomotive and early 20th century wooden caboose. Immigration: Through a short first person presentation, students will learn about the many immigrants who arrived in this region. Old-Fashioned Games: In the age before computers, smart phones and internet, children played a wide variety of games often inspired by what they found around them. Students will get a chance to try some 19th century games such as rolling hoops, games of graces and cup and ball. One Room School: Students will learn about a typical school day inside our 1840s Stone Academy. Journaling: Personal journals form the basis for much of what historians know about everyday life of the past. In this session, students will learn more about this lost art, listen to samples from original journals and create their own journal to take home. In partnership with the Lathrop House, we present a thought provoking look at the Underground Railroad and its connection to Northwest Ohio. Activities are tailored to the age of the students and the length of the visit. The program recommended for students in 3rd grade and up. Each session will focus on a different topic around the Underground Railroad theme. 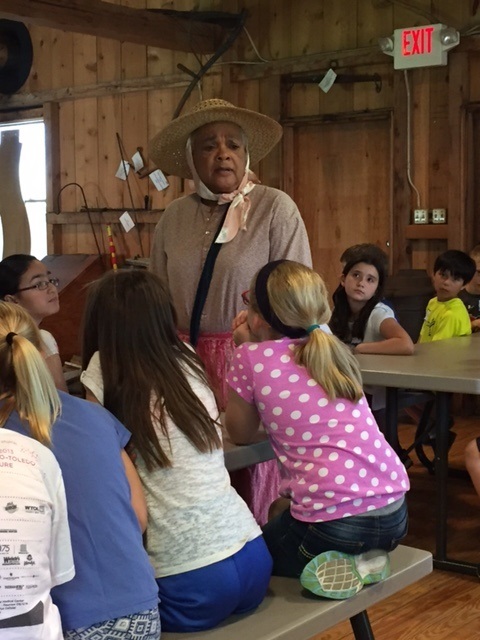 Daily life of slaves: Against the backdrop of the 1840s log home, students will learn more about the daily life of slaves in the south, their living conditions, types of labor, food and clothing. Escape: There were many ways that escaping slaves eluded those chasing them. This presentation shares the stories of some of the creative documented methods that slaves used to make their way to freedom. Triangle Trade: Students learn about the triangle trade, the economic engine of slavery, in an interactive presentation. Timeline: Students will understand that the Underground Railroad was part of a larger time line of enslaved people in the United States and also will get a sense of some of the issues that our country is still struggling with today. Abolitionists: The program introduces students to some famous abolitionists. Jeopardy: At the end of the day, students will participate in a lively game of Jeopardy to test their knowledge of facts learned during the program. Follow the River: Students participate in a short play that tells the story of an escaped slave. If timing allows, we can also include a visit to the Lathrop House, the only Underground Railroad stop in Northwest Ohio open to the public. This includes a tour of the home and will be worked into your program. Note: this option does include an additional cost and will require busses to transport you between the Historical Village and the Lathrop House. At the Lathrop House, students will experience history up close as they learn about our region’s role in the Underground Railroad. Although Ohio was a free state, the Fugitive Slave Act of 1850 meant that escaping slaves were not truly free until they crossed into Canada. Ohio played a key role on this trail to freedom known as the Underground Railroad. Sylvania’s own Lathrop House was one of the stops along the way. 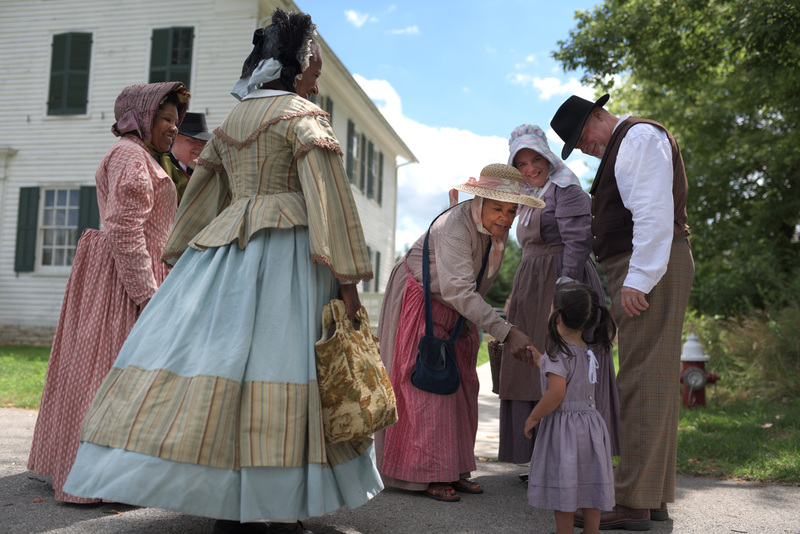 Through grade-appropriate activities, the students will learn about the complexity of life in Ohio in the years just before and during the Civil War. After an introduction, the students will get to tour the reconstructed basement kitchen of the 1800s home of Lucian Lathrop and his wife Larissa and see the hidden room behind the fireplace where escaping slaves spent the night before heading on to the next station. They’ll learn about Larissa and Lucian Lathrop, an Ohio State Congressman, who kept their role in the Underground Railroad secret. The Lathrop House provides an hour- long program for groups of students and adults with prior reservation. You must have at least 10 and no more than 25 at an hour session. Cost: $3.00 per student; $5.00 per adult. We can also combine a visit to the Lathrop House with the Underground Railroad program at the Historical Village. The cost for this combination program is $6.00 per student. This option does require additional time and busses must be present to transport the students between both sites. Contact us for more information. We can also visit your school for a customized program for $40 per program. Contact us for more details!